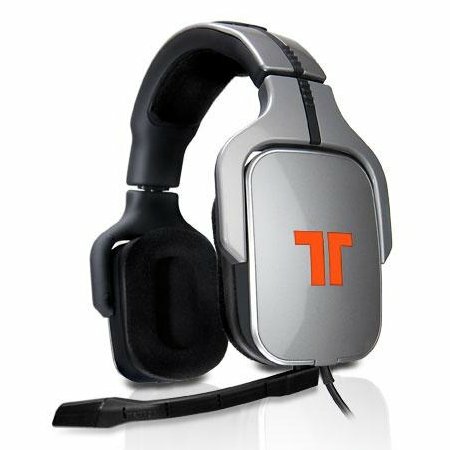 Mad Catz, a company that carries plenty of gaming accessories across different platforms, has just announced the new TRITTON AX Pro headset that will make its way towards the Xbox 360 and PS3 consoles. After all, Mad Catz knows just how important it is to have the right kind of headset if you want to pick up all the noise and sound a game has to offer while you maximize your gaming experience. With the TRITTON AX Pro, it does not matter whether you are a serious gamer or committed audio connoisseur – it is able to offer a truly authentic Dolby Digital 5.1 audio experience. Being different compared to Dolby Headphone technology, the AX Pro will use at least 8 precision-balanced speakers (with a quartet located within each ear cup) that will accurately reproduce 5.1 surround sound without the need for the common cop out move of emulating or simulating an audio experience. Within individual ear cups, the AX Pro will house a front speaker, a center speaker, a rear speaker and a subwoofer. It is capable of offering a full 4 speaker configuration inside each ear cup as mentioned earlier on, allowing the AX Pro to replicate a typical 5.1 home cinema installation, where it will provide gamers with a truly realistic and unparalleled audio experience. Apart from that, your eyes too will benefit from individual backlit volume controls which are handily located on the in-line remote, letting you access them even when all the lights around you are turned off. This too, lets gamers fine-tune each channel (front, rear, center, subwoofer) at the touch of a button without having to hide controls away on the ear cup. As for the in-line remote, those who game on another level (pro-gamers) can dial-in the exact sound field required in order to obtain a competitive advantage such as raising rear drivers levels and adjusting the bass. Your ears too won’t suffer from any kind of fatique since premium-quality ear pads come with each £149.99 purchase, delivering hours of gaming comfort for extended gaming sessions. This is really old news. They’ve been out for over a year at least!